Over the past few weeks I wrote a long series, posted at my Department’s own blog, in reply to another recently released draft document from the AAR, that one on research responsibilities. Since so much of this new draft is not actually on academic freedom at all (i.e., addressed to the institutional conditions that provide researchers and teachers with the necessary latitude to do their jobs) but, rather, on the scholar’s own duties and obligations to their students, the people with whom they work, and the people whom they study, it seems that much of what I wrote in that other series equally applies here. 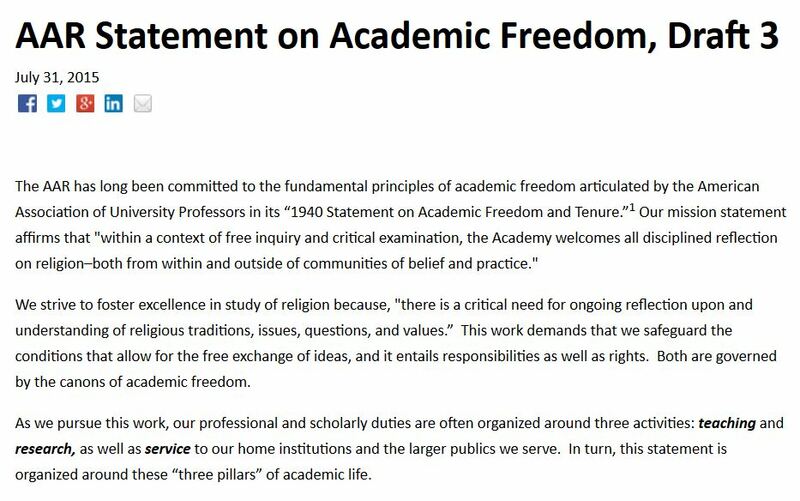 That is, the two documents are unnecessarily redundant (i.e., count how often you read the word “responsibility” in this academic freedom statement). So I’d prefer that readers, after looking through this new academic freedom statement, then work through my earlier posts on research responsibilities (notably, this one), to save me from being unnecessarily redundant here. Oh, and as they do this, I’d suggest that readers also ask themselves why the Board is so focused on an individual’s obligations when they think about writing on academic freedom? It’s almost as if they can’t conceive of structure-wide analysis and opt, instead, to think merely of the lone individual as being in need of governance. So, apart from questioning why a statement on academic freedoms frets so much over the researcher’s proper attitude (such as humility — something nicely addressed in previous posts in this series), and other than wonder why the Board stereotypes our students as they do (Question: do American history profs need a special warning about not troubling students who have never heard of, say, Parson Weems? ), or worry why this document is so wary of “collegiality” whereas the research responsibilities document uses the term unironically, one thing I can add is how such documents give us only half the story — that is, it strikes me that there’s an arbitrariness to much of what gets included in such statements, which makes we curious as to why some things are even here to begin with. For instance, why single out digital scholarship, as they do? The same rights of non-interference and the same standards of assessment apply to peer-reviewed digital scholarship that an institution is willing to count as evidence of qualification for hiring, promotion, and tenure. Of all the things that we, as scholars, do, why focus specifically on this one item in an academic freedom document? It seems odd, no? For publication of any sort isn’t mentioned at all apart from this one reference. Sure, the digital humanities is a trendy term now (though who knows what it really is, right?) but this is a document meant for the ages, or at least one that should have legs for a few years (this is the first update in a decade, after all), so why get so oddly specific on that particular point? The answer to that question, I’m guessing, is found in some particular situation that the Board had in mind (or pet peeve of one of its persuasive or more vocal members), which was likely discussed in drafting this document, but of which we, its readers, are by definition unaware. It’s a good example of what we see in most texts, of course: the codification process that comes with writing attempts to freeze what had earlier been a dynamic and, in all likelihood, contested process; unless owning to what it is responding (like this very series does), it leaves unrecorded (and soon forgotten) the alternatives and disagreements, along with the inspirations, goads, and prompts — in a word, history is lost, and that’s a great way to present the contingent situation of any document’s origins as necessity and inevitability, thereby authorizing what are, in fact, highly idiosyncratic statements. So has there been a rash of condemnations that the Board seeks to reverse? Is there a rising tide of scholars belittling digital publications? Are concerns over so-called trigger warnings in classrooms in the backs of the authors’ minds? We’ll never know, of course, and thus we’ll have a tough time making sense of why such a pithy document, on such an important topic, weighs in on seemingly arbitrary issues.